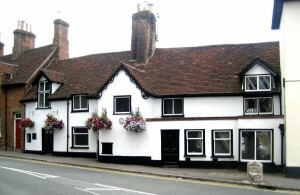 Just opposite St Mary’s parish church is Church Cottage, one of the oldest houses in Datchet. It is remarkably little altered since its first building in about 1500 with a major remodelling around 1600, and its timber frame structure is now visible through the whole interior. The northern end of the house is a later addition, perhaps from the early 1700s, and is of a lighter timber construction than the main building; there is also a much later single-storey extension across part of the frontage. An historical building survey was commissioned by a recent owner and this article is based on the resulting information. We call this a ‘cottage’, but it is in fact the substantial house of a relatively rich person, built using a great deal of expensive oak timber. Any building which was actually a cottage in 1500 would not survived for 500 years. The idea that houses like this were built from ‘ships’ timbers, re-used from dismantled ships, is generally a myth apart from a few documented exceptions near the coast. From at least 1780 until the late 1800s the house was a blacksmith’s dwelling, at first owned by George Hale, with a single-storey workshop on the adjacent corner site where there is now a dentist’s premises. 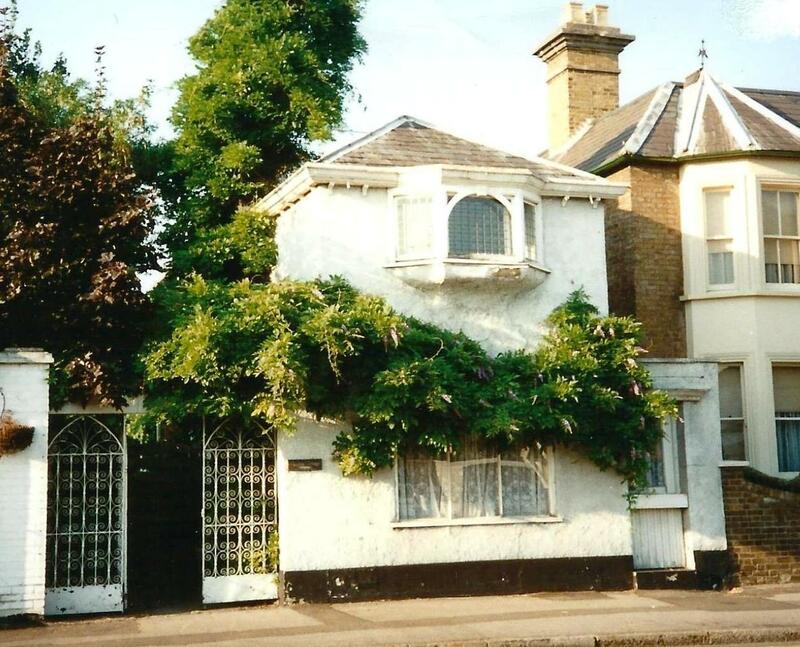 The whole corner, round to and including Horton Cottage, was owned by the same Hale-Pearce family who also built James Cottages next door in London Road in the 1850s. Evidence for the ownership and use of this house is good, going back to the 1500s and to a previous medieval building on the same site. It was part of the early development of the village around the high ground of the church where dwellings were safe from flood. 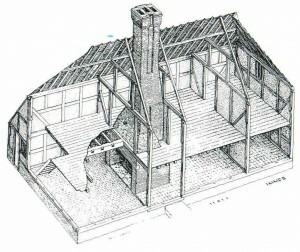 It was built as a typical late-medieval hall house, that is, with a main dwelling space (the hall) open to the rafters with a central hearth on the floor, from which smoke escaped through a thatched roof as there was no chimney. 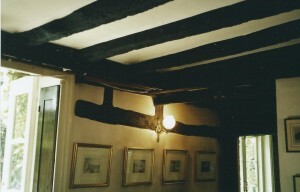 Some of the timbers in the roof space still bear the coating of soot which is a sure sign of an early open hall house. The house is now of the type known as one-and-a-half storeys, due to its being one original open hall with the upper floor inserted later into a space not really high enough for it. It is sometimes said that these low-ceilinged houses show that people used to be shorter than we are are now but even though they may have been that is not the real reason. 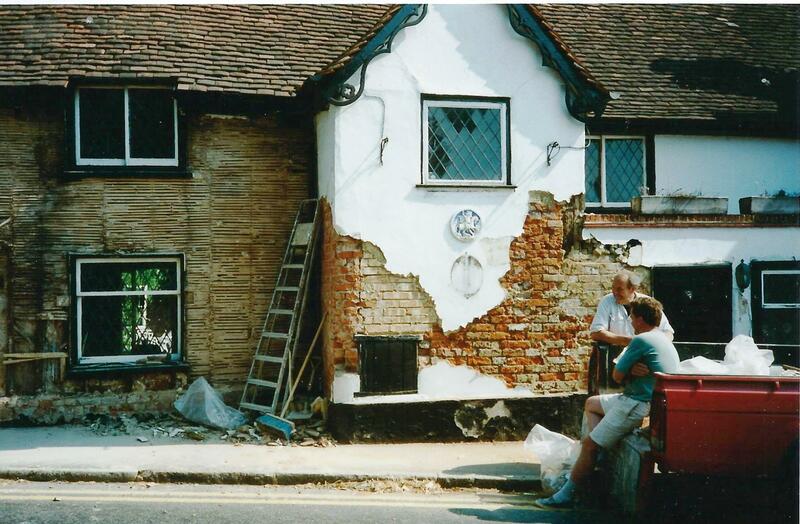 None of the timber frame is visible at the front, and it may always have been plastered over as that was a fashionable alternative, but the frame was left exposed at the back. A staircase would then be necessary and was often built within the narrow chimney bay. At Church Cottage a gabled front projection was built out in line with the chimney to contain the staircase, which was a common solution. (See photo above.) All Church Cottage’s windows are relatively recent, but the upstairs ones added in about 1600 would have been low down in the rooms as there was limited height; the present dormer windows are a more modern solution to the problem. 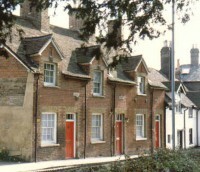 James Cottages were built by the Hale-Pearce family of Church Cottage in 1853, probably named in memory of James Pearce who had died in 1851 aged 40. (See below for the the Hale-Pearce family.) 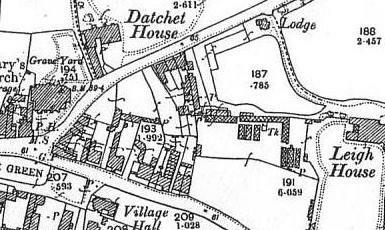 There had previously been houses or cottages on the site (see map below) so this would have been a rebuild, replacing unfit old dwellings with modern ones. They are unusual in being good-looking modest brick houses built at a time when very little on this scale and quality was being built in the village, and before the general boom in housing development. The Hale-Pearce family had been artisans in various trades for several generations and James Cottages were built to suit their needs and tastes. Although used as dwellings by the owners, they were also sometimes rented out. 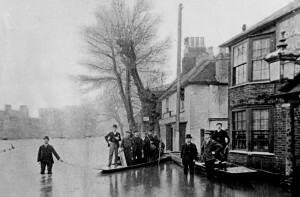 In 1947 Datchet’s flood rescue operations were conducted from St Mary’s Church and the foot of London Road, the only point where traffic could approach the middle of the village, and Church Cottage is on the fringe of the Church’s high ground. James Cottages, just a bit further north, safe and dry, was used as a distribution centre for food supplies, here selling ‘spuds’. This long narrow house was built into the back yard of Church Cottage (see maps below) in the 1860s, almost certainly by the first James Hale Pearce (1840-1898). He had become a master carpenter after the family had ceased to run a blacksmith’s business, and was later described as a builder. The Hut was the house’s formal name, presumably as a local or family joke. By 1901 his eldest son (of eight children and the second James Hale Pearce) had diversified further as an early electrical installer. In 1911 the family had moved to Buccleuch Road and in 1918 the young third James Hale Pearce was killed during WWI. He had been gassed in France and his parents hurried over hoping to see him in hospital there, but arrived too late. He was awarded the Military Medal and is remembered on Datchet’s War memorial. 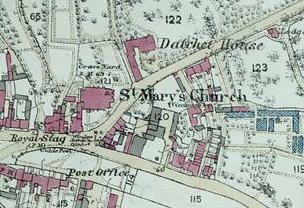 Map 1834: The Church Cottage property is marked as plot 183 in the 1834 map. It is the oldest surviving building of a series of dwellings, workshops and stables which once occupied the whole corner round from London Road into Horton Road, including land which ran eastwards to the next property, also running between the two roads, here marked as map plot 185. Plot 184 was an orchard belonging to Datchet House where two modern houses have been built. 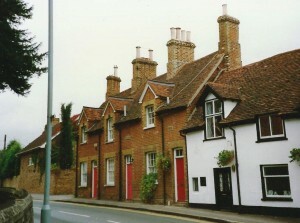 Although the present dentist’s premises on the corner is of no great age, there was a house (in red) on the corner site in 1834, and the blacksmith’s single-storey workshop can be seen as a very small extension facing on to London Road. Past the corner, access to the blacksmith’s yard was through a long entry gap from Horton Road beside what was probably the stable block, hatched in grey. 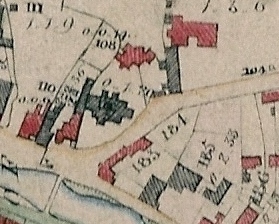 James Cottages now occupy plot 183 in the map, but dwellings are shown there in 1834, so the present houses are likely to be 1850s replacements of old cottages beyond repair. The 1834 map also shows the pool in the middle of the village before it was culverted underground, and the footbridge across it. Map 1876: The building right on the corner seems to have been rebuilt, and James Cottages had replaced an old row of dwellings adjacent to Church Cottages. An outbuilding (grey) had been added within the yard behind Church Cottage, and Horton Cottage can be seen as a long narrow block next to the big old stable. As this new block is hatched red it was a dwelling house, so Horton Cottage (or The Hut) was not a converted stable but a new-built house. By the time these developments took place the blacksmith and farrier business on the site had ceased and the first James Hale-Pearce, carpenter (later builder) was running his trade from Horton Cottage, where he was listed in the censuses 1871-1901. 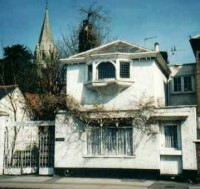 Church Cottage was occupied by other members of the family during this period. 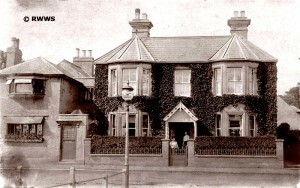 Map 1899: On the corner site, and stretching back east along Horton Road, is the shop which later became the International Stores and is now a dentist’s premises. By this year the big stable block adjacent to Horton Cottage had been replaced by the house called Clifton Villa. James Hale Pearce, living in Horton Cottage, described himself as a builder in 1891, and it may be that he demolished the old stable and built Clifton Villa in its place, making profitable use of his own family’s land. The next house to the east, Denholme, looks very similar and was probably built at the same time, but its site was not previously owned by the Hale-Pearce family. George Hale worked as a blacksmith and farrier (horse vet) at Church Cottage after the death of its owner William Lamb in 1799, who had run the business there since at least 1780. 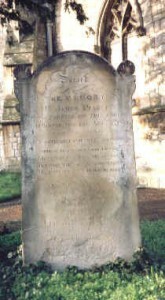 When William’s wife Elizabeth Lamb died in 1822 George Hale bought the property and business outright. 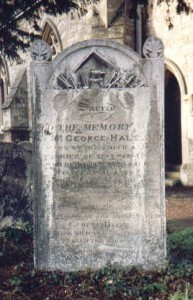 In 1813 George Hale married Ann Pearce at St Martin in the Fields in London. They had no surviving children and on George’s death in 1838 aged 76, his heirs were Ann’s two nephews, James and George Pearce. At the 1841 census Ann Hale was listed here alongside James as veterinary surgeon and the younger George as blacksmith, both with wives and children, all living in the Church Cottage complex of dwellings. By the 1851 census there was also a third Pearce nephew there (Alfred Frederick, another farrier), as the family and business reached its peak of activity. At that point, the family suffered an extraordinary series of deaths, perhaps due to the great cholera outbreak around 1850 which had particularly affected Windsor. In 1851 James Pearce died aged 40, followed in 1852 by both George Pearce aged 34 and their aunt Ann Hale aged 78. Finally, in 1858, the last nephew Alfred Frederick also died, aged 32. From then the records show that the sons of all three nephews, born in the 1840s, used the surname Hale-Pearce as well as their fathers’ first name: George, James and Alfred Frederick Hale Pearce, though only James Hale-Pearce’s family continued in Datchet. The family’s blacksmith and farrier business was kept running for a few more years by Elizabeth Pearce, widow of James Pearce since 1851, as she became the head of the household in 1861 and in 1871 was described as ‘formerly farrier’. 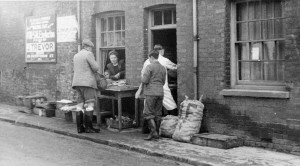 It was not unusual for widows to continue to run family businesses at the time. The tombstones of George and Ann Hale, and of their nephew James and Elizabeth Pearce are exceptional in that they face outwards from inside the churchyard wall towards their own Church Cottage, although this might not have been their original position. 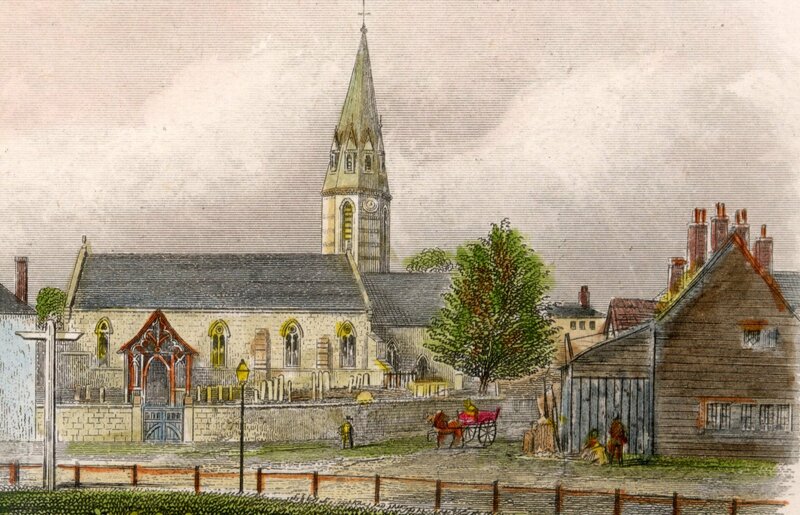 The coloured engraving of the rebuilt church in about 1860 includes a detailed drawing of the single-storey blacksmith’s workshop adjacent to the southern end of Church Cottage, designed to be replaceable in case of fire and to protect the main building. The gable end wall with windows may represent the original south wall of the early Church Cottage building. 1770s William and Elizabeth Lamb had bought the Church Cottage property from John Fleetwood Marsh, the last of the powerful Marsh family of landowners who sold all his inheritances before emigrating to America in search of religious freedom as a non-conformist. 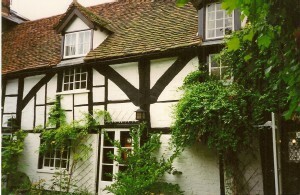 John Fleetwood’s father was Daniel Marsh, who had inherited the Church Cottage property in about 1770 from Elizabeth Chennell, including the house barns, stables, yards etc in Datchet, and 42 acres of land belonging. 1640s Ownership by the Chennell family goes back to 1642 when Henry Chennell inherited from his sister Margaret Chandler. 1620s In 1622 a survey of the Manor of Datchet recorded Henry Chandler owning property including the house called Woodgates Hall, held by right of his wife Margaret who was heir to John Mathewe. 1580s In 1586 a legal marriage settlement was drawn up, which includes: Margaret Mathewe is daughter and heir to William Matthewe deceased, she is to marry Henry Chandler, she owns a house called Woodgates. 1550s In 1552 the Mathewe family was recorded in a muster list, of men in Buckinghamshire liable to military service: Robert, Richard, William and Thomas Mathewe. 1540s In 1548 a survey of the Manor of Datchet listed John Mathewe owning a house which once belonged to John Mathewe his father, and it is probably this elder John who appeared in a taxation list of 1524. This is an exceptionally clear ownership sequence leading back to about 1500 when the house was probably built, and is sufficient evidence to say that it was built by one of the Mathewes and very likely by a John Mathewe. It is also possible that the addition of a chimney and upper floor in around 1600 can be ascribed to Henry Chandler who acquired the house on his marriage to Margaret Mathewe, a likely occasion for such an improvement to be made. 7) Woodgates Hall in the 1300s? It seems that the name Woodgates Hall must have an obvious origin: a big house with wooden gates, but there is a more intriguing possibility. Until late medieval times the letter sounds y and g were interchangeable, as at Symonds Yat on the Wye, which means Symonds Gate. A series of very old deeds in the National Archives records a house in Datchet owned by the Wodyet or Wodiet family, and a house which was remembered as Wodyats (as houses were commonly called by the name of the first owner or builder) could easily become, by using the spoken y and g interchangeably, Woodgates Hall, a Hall being a medieval house. This seems a highly plausible explanation for Woodgates but it is not being suggested that the present house dates from before about 1500. The sequence is tenuous and since these people owned other property in the village the deeds might not relate to Church Cottage, but if John Fysschere owned a house in Bury Street, it is very likely to have been this one. The place-name element Bury is a very common Saxon word, meaning a fortified hill or a defended manor house; it has nothing to do with the burial of the dead. It lends weight to the theory that the site of the church was a very early fortified settlement, compared with the low-lying surrounding land. Bury Street suggests that a lane ran between Wodyats house and the present church, where London Road now runs, although this was not a main road until very much later. So the 1413 deed suggests that the Hale family might then have owned an earlier building on the site of Church Cottage, called ‘Wodyets’, which by 1500 had passed to the Mathewes. How curious that by 1800 it was owned by another Hale family. One last tantalising glimpse into the remote past: at some time in the mid-1970s the present researcher saw several skeletons, exposed during very deep excavations for service pipe-laying, beneath the road immediately in front of Church Cottage. They were not reported to the Coroner, as they should have been, but one other resident confirms seeing skeletons then. It is assumed that the churchyard once extended much further across the road, and it is known to have been reduced in size several times in more recent centuries. Until any further deep digging, the story must rest there!